No son gran cosa, puesto que no tienen ahora mismo ningún modo de cargarles software (Ni por SD, ni flash, ni por entrada de audio EAR/cassette), pero valen para entretenerse un rato. Como siempre, lo típico, remapeado de pines y algunos cambios para que al menos medio funcionen en el ZX-UNO. Se han sacado de otros ports de pipistrello (LX45). Ambos proyectos Xilinx se abren con ISE 14.7. Siempre vamos a usar ya esta versión. Es lamás rápida y más optimizada para sintetizar. - A pesar de que está presente la señal TAPE IN, está completamente sorda, y no carga cassettes. Por lo que veo, no debe estar implementada toda la circuitería que hay entre la entrada y el VIA 6522, porque veo que está prácticamente puenteado a pelo... digo yo que algo faltará en medio para que funcione bien. Es sólo una suposicion. - Va con teclado PS/2, mapeado inglés, si no recuerdo mal. Any progress to the part of loading software somehow? Estaria bien poder cargar programas por SD y poder guardarlos, tengo buenos recuerdos de esta maquina, de echo tengo un Oric Atmos. De todas maneras un buen trabajo enhorabuena y Muchas gracias. 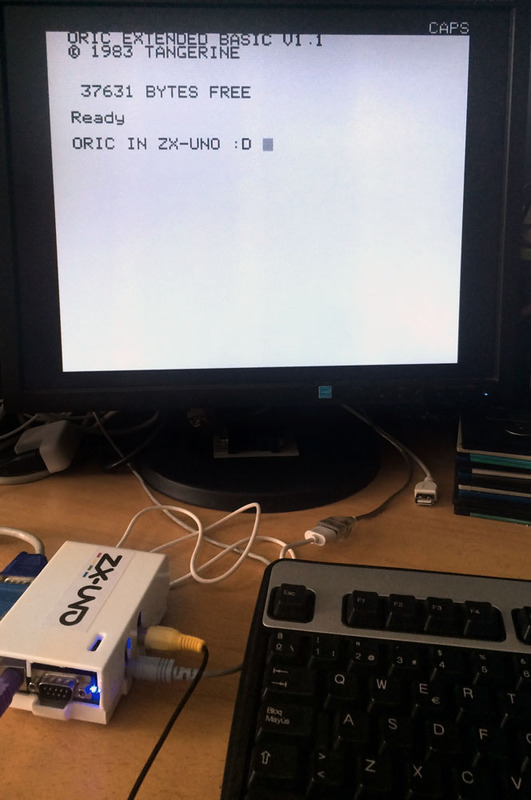 I've modified the Oric Atmos core a little bit. I've fixed several bugs in ULA & VIA, also changed the used CPU core, since it didn't support the undocumented opcodes for the NMOS 6502. I've made VGA output work (and made a switch with a keyboard VGA<-> RGB, although RGB mode may require some more testing, last time I've tried it there were some glitches). I've implemented read-only (for now) DOS8d support (dos using apple disk II formatted floppy disks, used on the bulgarian Pravetz 8d clone of the atmos). The implementation is similar to the apple ii core for the zx-uno - images are written raw in nibbelized format on the card. The current image can be changed with keyboard keys. Also NMI & reset can be performed with the keyboard. The cpu core was changed because the dos used the undocumeted opcodes (and didn't work with the T65 core). The tape input din't work last time I've checked it, but later, I found (and fixed) bug with the VIA's timers, and may be I should test it again. Nevertheless one could load anything with the DOS8d. Multitape progrorams might be a little more tricky to run. Wait a moment, I'm thinking... YES, YES, YES! OK, so, I'll make sure composite & RGB output work & I'll upload it somwhere. You can try the core. I couldn't load successfully any tape. You can try it - it might work. The default video mode is VGA - press scroll lock key to switch to composite/rgb. I've included a demo disk with few games - they all work. Any comments, bug reports and suggestions would be appreciated!